We're still smarting after the Texans couldn't beat the Jets by 9 points or more on Monday night even with a performance that should have been just enough but anyway we're back with selections for Sunday as we look to bounce back. The season long bets of the Texans for the Super Bowl & the 49ers to win the NFC are still looking good & there should be plenty of opportunities for nice bets between now & the post season. In the first game we're taking a look at we have a divisional rivalry as the AFC North sees Cincinnati travel to take on the NFL's only team without a win in 2012, the Cleveland Browns. Cleveland are a pretty poor side as evidenced by their record this year & just 4 wins, against weak sides, last year & they've already lost to the Bengals this time around just 4 games ago with Cincinnati prevailing 37-24. The Browns have rookies playing at their two key skill positions on offense with Brandon Weeden at qyarterback & Trent Richardson at tailback, both were selected in the first round of the draft but Richardson has started at lot better than Weeden. Brandon Weeden is stone last in the quarterback ratings this year at a lowly 64.5 & although he had his best display when facing the Bengals (2 TDs & no interceptions) he can't be relied upon when the pressure's on. Rookie passers struggling is nothing new & it is all a learning curve for Weeden, the Browns will try to take the pressure off by running the ball with Richardson & although he's done reasonably their other backs have offered next to nothing. With the Brown's pretty lightweight offense they've needed their defense to step up but that side of the game has been weak too, ranking 29th in yards given up & they don't really have any defensive stars other thancornerback Joe Haden who returns this week from suspension. 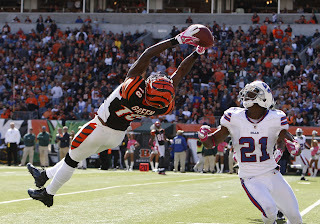 The Browns need Haden back because he'll be up against one of the very best receivers around in the Bengals' A.J. Green, Green already has 4 touchdowns & is pushing 100 receiving yards a game as he continues to form a fine partnership with passer Andy Dalton. In contrast to Brandon Weeden, Dalton is having a fine season & has thrown 9 strikes to 6 picks & is gaining an impressive average of 8 yards per pass - he'll fancy himself to have more success in this one. The Bengals are just average defensively & they don't tend to make explosive plays (they've gained just one interception all season) but average means not bad & they have little to fear today. We think the Bengals should be hotter favourites than they are & odds of 10/13 for them to pick up the win are fair indeed even though playing on the road. 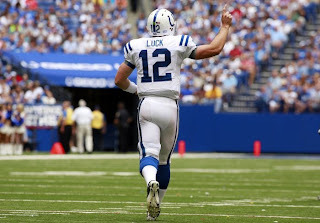 In this game we again like the look of the road team as the Colts travel to take on the New York Jets who put up a spirited but ultimately fruitless display against the Texans on Monday night. Last week while the Jets were being beaten, Indianapolis managed to gain a win over one of the league's heavyweights in the Green Bay Packers & number one draft pick Andrew Luck had a great game as he continues to look much more experienced than the rookie he is. Although the Jets did only lose by 6 to maybe the best team in the league on Monday that was in part thanks to a 100 yard kick return & those don't come around too often, it also remains to be seen whether they can get themselves up for consecutive games as they've been abysmal at times. The Jets' injury problems remain & Mark Sanchez still looks a suspect passer & their running game continues to be ineffective with their number one runnig back Shonn Greene averagin just 2.9 yards per attempt. Indianapolis will be sending their star defender Dwight Freeney after Sanchez making it even more likely he'll chuck some passes up to be intercepted, Freeney was injured in week one & made a real difference on his return last week. The Colts have been decent offensively with Luck's passing helping them rank 10th overall in yards gained & 6th in passing yards - he can also take off on the ground making him a very dangerous player & it means he's a good compliment to rusher Donald Brown who has a decent average yards per carry of 4.0. Reggie Wayne has been having a monstrous season with 506 receiving yards in just the 4 games & he'll look to beat Rodgers-Cromartie this week just like every other cornerback he's come up against. Other than their loss to Jacksonville the Colts have performed well considering they gained just two wins last year & they are underrated today, backing them with a useful 3.5 point lead on the handicap looks the way to go.